Indications: Shen disturbances, "Heart Heat" or agitation. 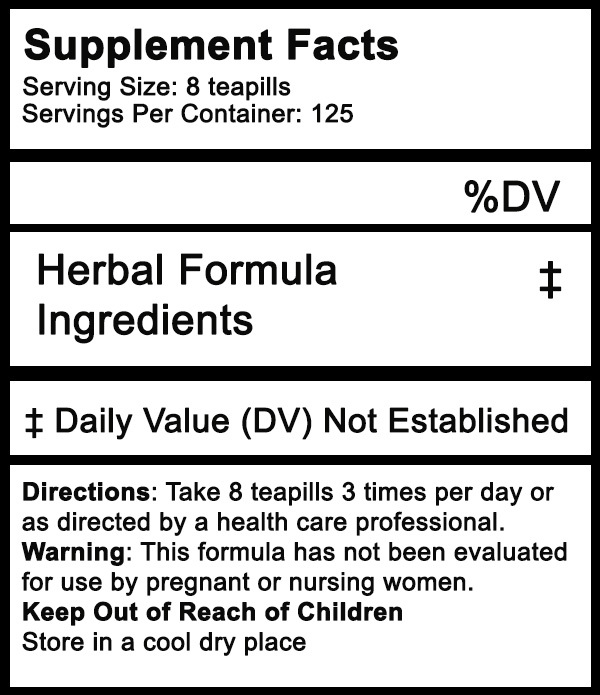 This formula contains calming "nervine"-type herbs. In Chinese medicine, the Heart houses the mind during sleep; sleep disorders are often a sign of "Heart Heat" according to TCM. This formula helps calms the mind, and soothes the Heart energetic organ system. This natural herb blend encourages relaxation leading to normal sound sleep, or to utilize during stressful times. Related Articles: Learn about the many causes of sleep disorders and how Liver Qi Stagnation is a common root imbalance that leads to sleep problems. Directions: Take 8 teapills 3 times per day, or take 8-24 teapills just before bedtime, or as directed by a health care professional. Schisandra chinensis fruit, or wu wei zi fruit is an ancient Chinese herbal tonic used for wellness, longevity, and to calm the Shen according to Traditional Chinese Medicine (TCM). Scutellaria latiflora herb, or skullcap is a western nervine herb that is gentle but very calming; it should not be confused with the Chinese herb scutellaria that is used much differently. Rosa spp.centifolia flower, rose, or mei kuei hua is a common flower used to calm the Shen, or mind in TCM. Prunella vulgaris herb, heal-all, self-heal, or xia ku cao soothes Liver Fire and overactive Liver energies that attack the Heart and cause emotional upset and insomnia. Lavender officinalis, lavender flowers, or xun yi hua cao is well known for its calming properties and is a common western herb used to help calm and relax. Foeniculum vulgare seed, fennel seed, or xiao hu xiang benefits the Liver and improves the digestibility of this formula. Verbena hastata herb, blue vervain, or ma pien cao is a western herb used to release emotional constraints that are deep seeded and long standing so that the mind can be calm.